Notice! DoubleTree by Hilton Hotel Kusadasi does not accept reservations at this time. Please try again later. DoubleTree by Hilton Hotel Kusadasi Contact. DoubleTree by Hilton Kuşadası, located in the heart of Kuşadası, offers its guests an enjoyable holiday opposite the Kuşadası marina. The facility has 88 rooms with a modern and stylish design. Rooms; minibar, safe, air conditioning and bathtub. You can stay healthy and fit during your stay with the facilities including indoor and outdoor swimming pools, sauna, steam room, 6 massage rooms and sports facilities. The restaurant is located on the terrace restaurant which has Kusadasi Bay and marina view as well as a restaurant where Turkish and World cuisines are served different delights and tastes, especially Mediterranean cuisine. There is also a shopping and life center built of historic stone houses. 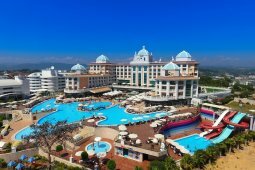 DoubleTree by Hilton Hotel Kusadasi accepts VISA and reserves the right to temporarily hold an amount prior to arrival. DoubleTree by Hilton Hotel Kusadasi accepts Master Card and reserves the right to temporarily hold an amount prior to arrival. DoubleTree by Hilton Hotel Kusadasi accepts Maestro and reserves the right to temporarily hold an amount prior to arrival. DoubleTree by Hilton Hotel Kusadasi accepts American Express and reserves the right to temporarily hold an amount prior to arrival. DoubleTree by Hilton Hotel Kusadasi accepts Bank card and reserves the right to temporarily hold an amount prior to arrival. DoubleTree by Hilton Hotel Kusadasi accepts ATM card and reserves the right to temporarily hold an amount prior to arrival. Bed and breakfast accommodation; all food taken outside the morning breakfast is paid. All beverages at the facility are charged. Only in room accommodation; All food and beverages are charged at the entire facility. A la carte restaurant booked and paid. The DoubleTree by Hilton Kuşadası rooms start at 14:00. The departure time from the rooms is no later than 12.00. Pets are not allowed. The use of open spaces that serve as testers depends on seasonal conditions. It is meant to provide as much information as possible on location, maps and public areas of the hotel. No responsibility is assumed for the accuracy of this information. It is the responsibility of the passenger to contact the hotel directly to ensure the most up-to-date full settlement information and directions. The person making the reservation is obliged to enter the names of all the persons who will stay in the hotel correctly. It is the person's responsibility to ensure that the correct email address and the correct mobile number are entered for transfers when making your reservation. Lovely hotel, great location (near the marina and the beach). Didn't try the food at the rooftop restaurant but it has a great view!